Unfortunately, this changing landscape means that many New York City residents are likely to experience a dramatic drop in living standards as they age. Only 33% of employed New York City residents ages 25-64 had access to an employer-sponsored retirement plan, 6 percentage points lower than in 2006. Retirement plan coverage for older New York City workers ages 50-64 declined 10 percentage points, from 47% in 2006 to 37% in 2016. The coverage rate for women declined 8 percentage points, from 42% to 34%. Nearly half – 48% – of near-retirement New York households have less than $10,000 in total liquid assets. The median liquid assets of near-retirement households residing in metropolitan areas of New York State is just $5,000 for single households and $60,000 for coupled households. Retirement plan coverage in New York City is 4 percentage points lower than coverage in the rest of the United States and 6 points lower than the rest of the state. Coverage rates in New York City have trended downward for 20 years. The current 33% coverage rate is down 9 percentage points since 1998. 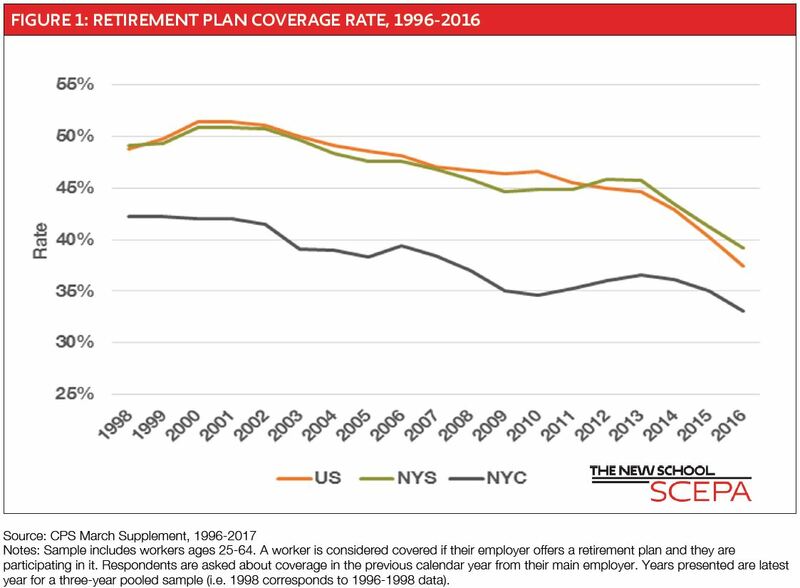 While the coverage rate declined 6 percentage points for the general population of New York City between 2006 and 2016, declines were significantly greater for older workers and women and varied by race and industry. While women saw a steeper decline than men, women experience slightly higher coverage rates because they are disproportionately employed in the only two industries with coverage rates over 40%, educational services (56%) and public administration (64%). More than 1 million households, or 42% of near-retirement New York households, do not have a DB or DC pension in a current or past job. Most households in this group have no liquid assets and will be entirely dependent on Social Security income in retirement. While households with DB pensions have fewer liquid assets than those with DC accounts, DB pension income more than makes up for this difference, putting households with a DB pension in a better position to maintain their living standard in retirement. Households with DC plans are able to accumulate more assets during their working years than households without any retirement plan coverage, but can only replace 56% of their pre-retirement income, just 4 percentage points higher than households with no retirement plan (52%), reflecting their higher pre-retirement incomes. Households with a DB plan (68%) are best situated to maintain their living standards in retirement. 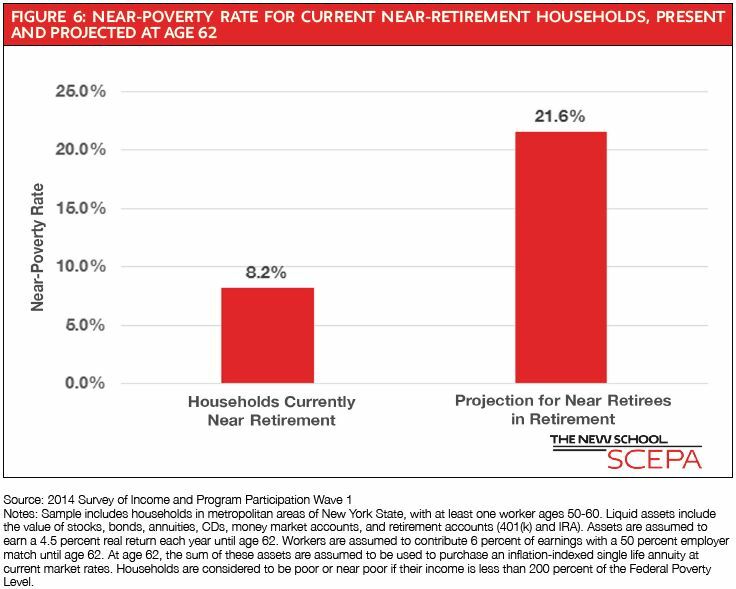 If workers in near-retirement households retire at age 62, the share in poverty or near poverty will more than double, from 8.2 % while working to 21.6% in retirement. Policies aimed at providing workers access to employment-based retirement savings vehicles, such as Guaranteed Retirement Accounts (GRAs), would help confront the coming retirement documented in this report. A GRA is a mandated, professionally managed retirement account. It is a hybrid between a defined benefit pension and a 401(k)-type defined contribution plan because it involves individual savings (with matches from the employer and government and a guarantee of principal from the government), but pays annuities in retirement. As supplements to Social Security, GRAs can be implemented at the city, state, or federal level and would provide all workers with a retirement account. Are Philadelphians Ready for Retirement? Are U.S. Workers Ready for Retirement?